You know that I am not asking you to get sick, right? I mean most people I know have suffered from cold or flu, some with very nasty ones, this past week or so. So I am going to introduce you a typical home remedy that Koreans, at least in my household, use when we get sick from those mean viruses. This is a jarred citron tea, somewhat similar to marmalade. 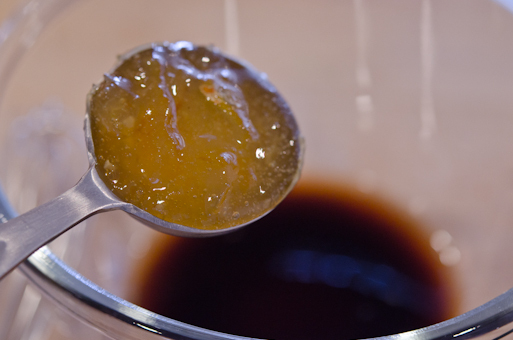 It basically is sliced citron fruits in honey/sugar mass extracting all the juices from the fruits. Whenever my poor husband, whom I mostly abandon these days, gets sick, he asks for this tea. It soothes sore throat, plus it tastes awesome. Why am I showing you this jarred tea when this post is about beef salad…? 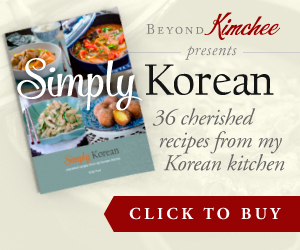 Well, because I want you to drive to your Korean grocery store right away at this moment and buy one jar for yourself. 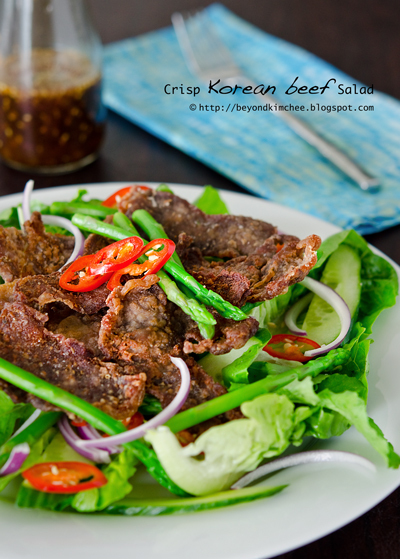 You can follow my recipe to make one of a kind “Crisp Korean Beef Salad” with it. I am going to use this in the dressing. Here are your glorious ingredients. 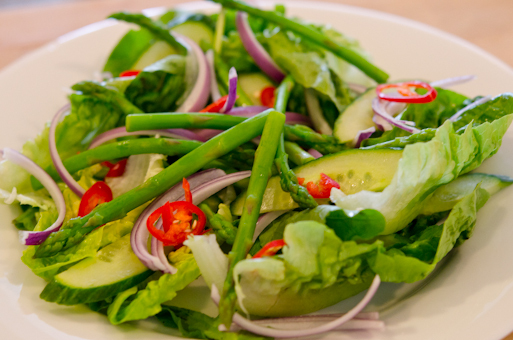 Salad greens, asparagus, cucumber, red onion, red chili, beef, soy sauce, citron tea, sesame oil, apple cider vinegar, and sesame seeds. 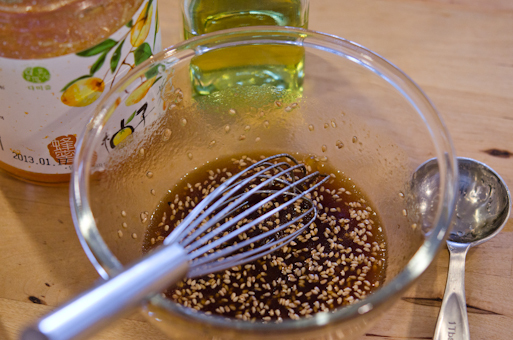 You will also need grape seed oil and pepper. For greens I use rockets and baby cos lettuce. Just wash them and wrap them in a kitchen towel or cloth in the fridge to make them crisp. Blanch the asparagus in the boiling water with some salt. Perhaps for 20 seconds…? Drain and rinse under cold water. Keep them cold as well. 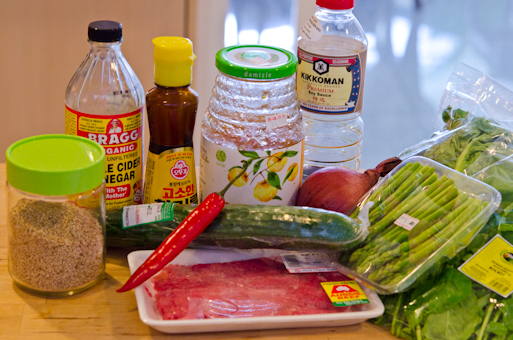 In a small mixing bowl, mix some citron tea and the other dressing ingredients. Whisk them well. You will get some chunks of citron fruit and it is okay-lah! You can prepare this ahead of time up to this point. 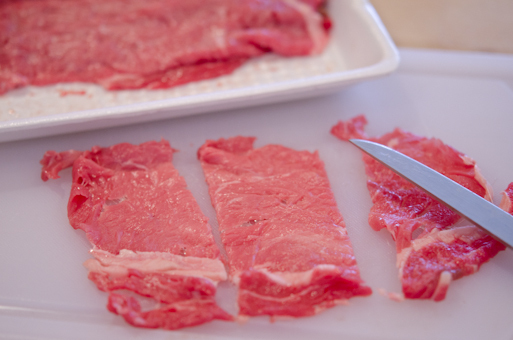 Cut beef slices into any size you like. I like mine big. I used very thinly sliced beef rib eye. Any Bulgogi meat would be fine. Season with salt and pepper lightly. 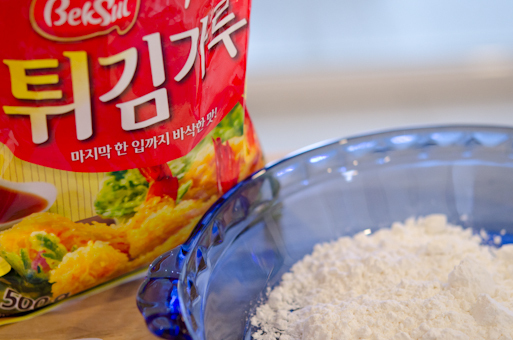 Pour some Korean deep fry flour mix in a shallow bowl. Or use corn starch instead. 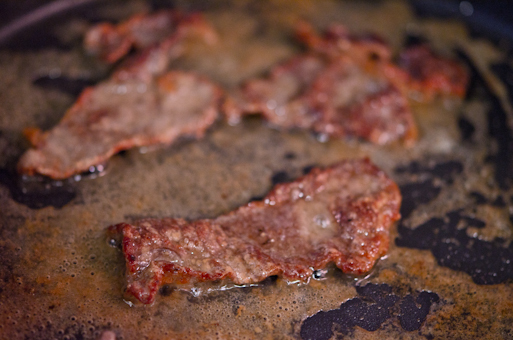 Coat your beef with flour lightly. Heat generous amount of oil in the nonstick skillet over medium high heat. 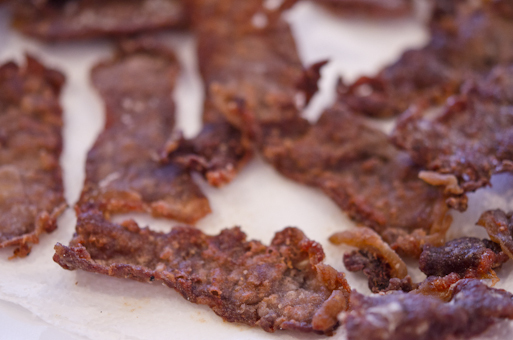 Fry your beef until the edges gets crisp, about 1-2 minutes on each side. When done, transfer on to a plate with paper towel on it. 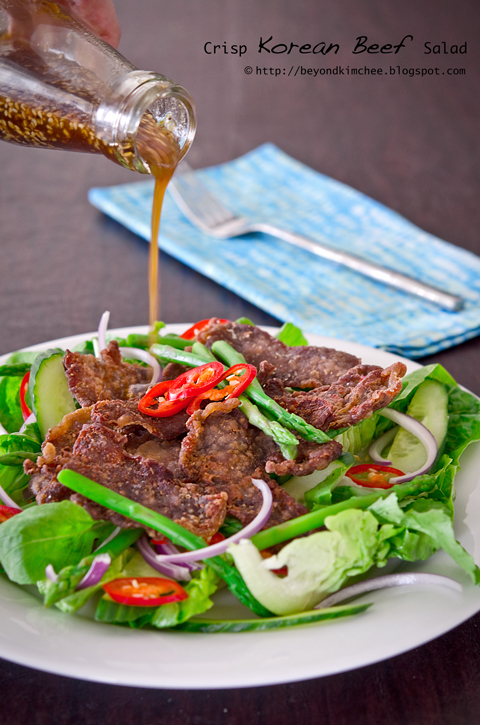 Add the crisp beef on top and drizzle your glorious dressing. Aaaaah…, what a wonderful life! 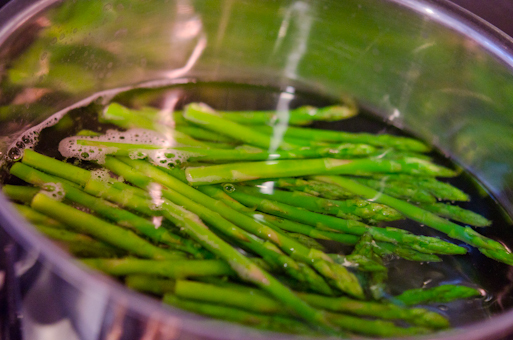 Bring a small pot of water to a boil, add salt and asparagus, blanch for 20 sends. Rinse under cold water and drain. Set aside in the fridge. 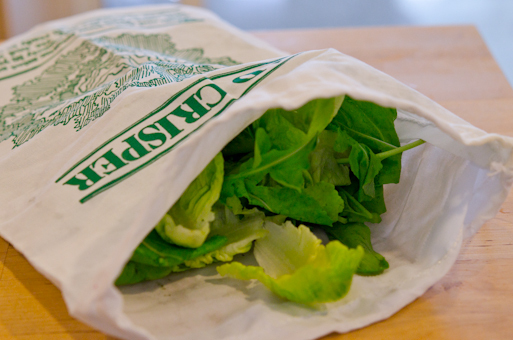 Keep all the salad greens and lettuce in the fridge to chill as well. Make dressing by mixing all the ingredients. Whisk well and keep in the fridge. Season beef slices with salt and pepper. 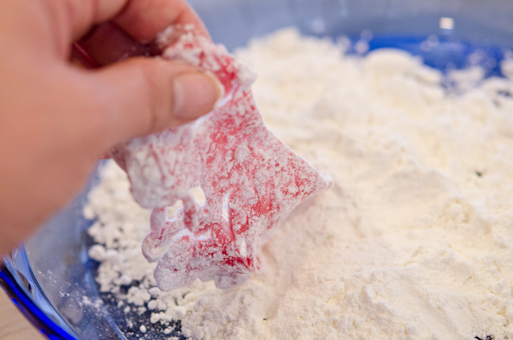 Coat each slices with flour or corn starch. Heat oil in a non-stick skillet over medium high heat. 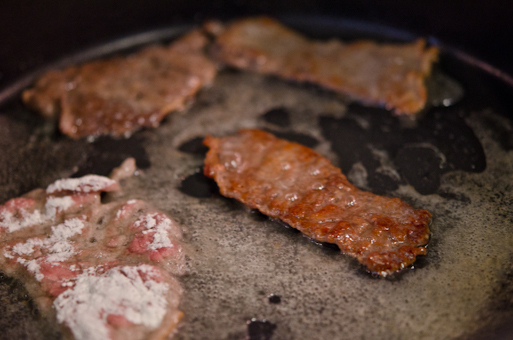 Add the beef slices and fry until the edges gets crisp and brown, about 1-2 minutes. Flip to the other side and continue to fry. 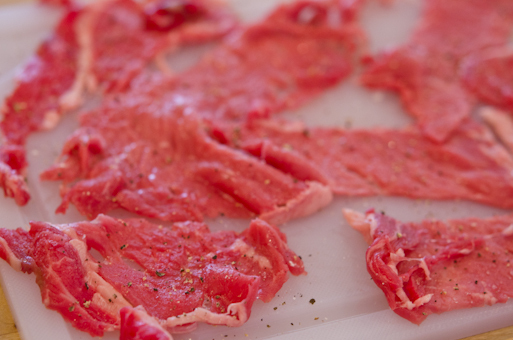 Transfer beef slices onto a plate with paper towel on. 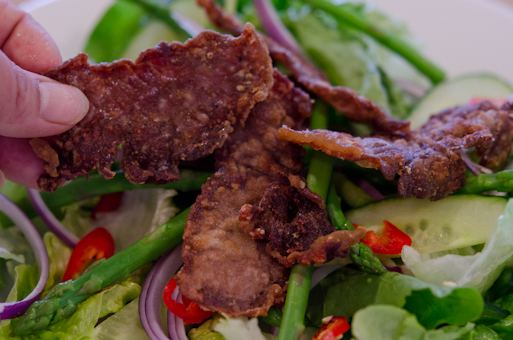 Assemble your salad on a plate and place crisp beef slices on top. Drizzle the citron dressing, toss and enjoy. « Fried Anchovies and Peanuts, love or hate? Yay!! You're back. 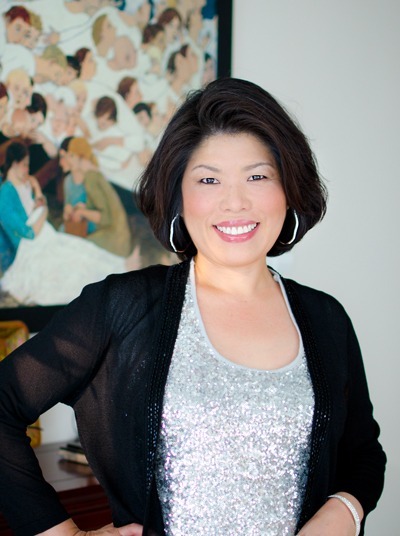 I'm glad you had a great summer and I can't wait to try out some of your recipes. Wow you have picked up the "lah" from us Malaysians. Thanks Cindy. 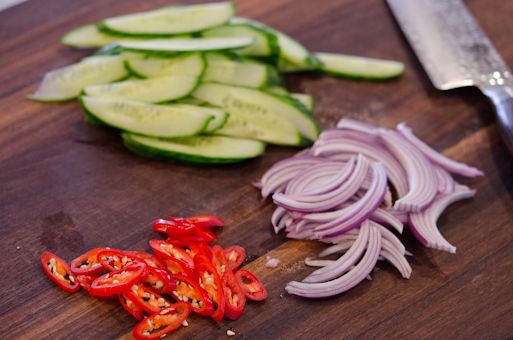 Hope you can try some of my new recipes. It can last quite long in the fridge. I am not much of tea drinker either but I love to drink this yujacha on the cold winter afternoons. I'm so glad you posted this recipe! I've always wondered what else you could do with that citron tea...now I've got an idea. Thanks! I've never heard of citron tea - sounds delish. I'll definitely have to pick up a jar. And the salad? I love meat salads, and this one looks excellent. Great post - thanks. Looks great - hope to try it out this week. Happy New Year! 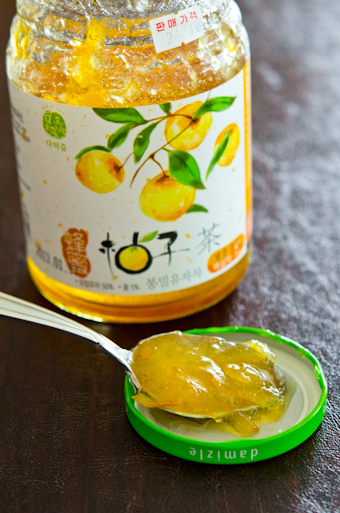 I was searching for Korean Apple Cider Vinegar, then I stumble upon your blog. love recipes here, i should try.